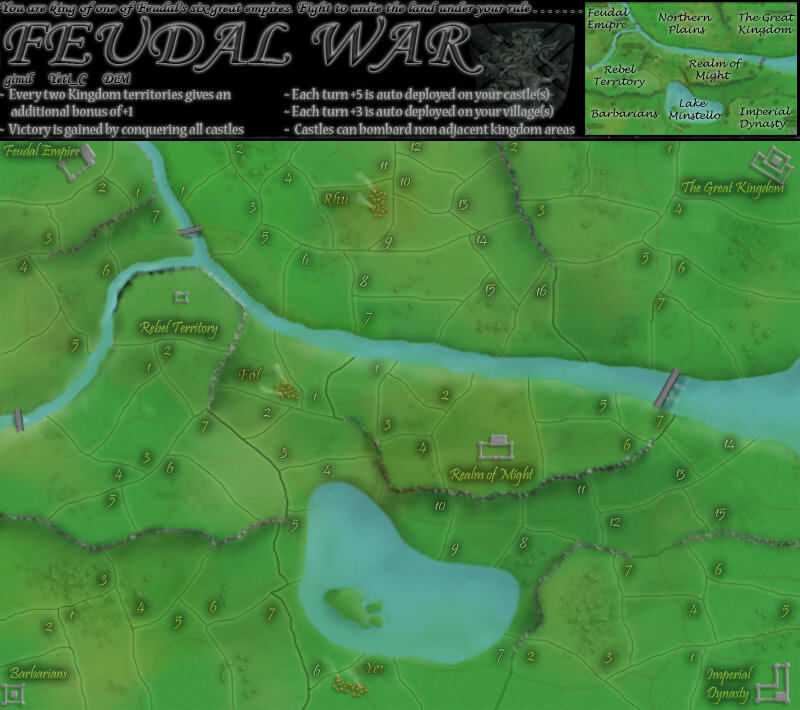 Feudal War is one of my favorite maps, an everyone (including myself ) think they are great at the map. There are 2 Phases to this tournament, Gaining Power and Quelling the Uprising. Well, firstly you are simply a citizen of a castle (or village and I am going to stop adding "or village" because you get the point) and you need to win control. To do this you have to eliminate 5 other opponents vying for the same control you are, to become the Feudal Lord. There is no order in a Feudal society, so the games will be Freestyle. This isn't the 20th century, nukes were not developed. You cannot see your opponents armies, so the games will be fog. First, there will be a 6-player Standard Game, the 5 losers get another chance while the winner advances. Then, there will be a 5-player Standard Game, the 4 losers get another chance while the winner advances. Lastly, there will be a 4-player Standard Game, the 3 losers are beheaded while the winner advances. There will be a 3-player Standard Game for control, the winner advances and the losers become his/her minions biding their time. After this, there will be 8 players left, each representing their own castle. Now, they must march on to unite the realms. The player will be placed in a random order. Each round, the first player chooses a lord to "attack", then the second player chooses a different lord to "attack" etc. until the last player is forced to attack 1 remaining player. If you successfully defend your castle you maintain it , if you fail to defend your castle you lose it. If you successfully assault a castle you capture it , if you fail to assault a castle, your opponent retains it. All games will be 1v1, Sequential, Fog, and the remaining settings based on the defending territory. After this, 4 players will remain, each with 2 castles. The same thing is done again with these 4 however you assault/defend 2 castles a round (if possible). After this 2 remain. Each with some number of castles + villages. Now up to this point castles and villages were equivalent, but we all know what the objective in Feudal is, and that is to "Unite the Lands"
They fight in a 3-player Standard Game, the 2 losers are actually killed while the winner advances. This winner will fight your 2 minions (the people who won the initial 6/5/4 player games, but lost for complete control of the castle) in another 3-player Standard Game, the 2 losers are actually killed while the winner advances. Now you have 2 minions from each of the 7 remaining castle/village, and a ruler from each village who miraculously escaped . The 2 minions will fight in a best of 3 1v1 game with their designated settings, and the losers are actually killed . The winner fights another best of 3 1v1 for control of the castle/village against the prior ruler and the losers are actually killed , while the winner advances. Now, there are 8 players left and you presiding over all of them. For your cruel entertainment, you have them fight each other. In a best of 5 1v1 series, they battle twice on each of their home maps, and you decide the tiebreaker settings. Being the cruel leader you are, people don't like you, but you don't give a f*ck your the dam ruler, so you do it again. In another best of 5 the 2 remaining players battle. At this point everyone hates you, and the 1 Lord left decides to challenge you. You will battle in an epic 7 game 1v1 series. He picks a setting for his 3 games, and you pick the settings for your 4 games cause guess what you're still the king. If you win you've proven yourself and you win. If you lose your dead so you don't think, and the uprising was successful. If somehow you guys tie, then I am Shakespeare and Fortinbras will rule. Last edited by qwertylpc on Sun Apr 28, 2013 9:29 pm, edited 7 times in total. This is a little bit of a crazy setup, so I want to make sure I understand what's going on before I give it the OK.
qwertylpc wrote: Feudal War is one of my favorite maps, an everyone (including myself ) think they are great at the map. That should be 24, not 18, right? Is there some kind of ranking system or is it random who gets to pick first? What's to stop someone from having 5 castles and 3 people with just 1? Once someone holds 2, are they automatically through? Now a few days go by, and you've already become a lazy ruler, a fact which your opponents want to capitalize on. In your initial castle, there are 3 knights who you thought were beheaded who really are alive. This winner will fight your 2 minions in another 3-player Standard Game, the 2 losers are actually killed while the winner advances. How are you deciding who is the ruler, minions, and knights? chapcrap wrote: This is a little bit of a crazy setup, so I want to make sure I understand what's going on before I give it the OK.
That should be 24, not 18, right? Yes I fixed it. qwertylpc wrote: After this, there will be 8 players left, each representing their own castle. Now, they must march on to unite the realms. The ruler is the person who won that village already in round 1. The minions are the people who won the first stage of round 1 but lost their game for control. I'm in for Feudal Empire. chapcrap wrote: Everything looks good.